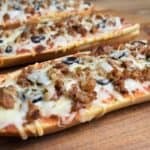 This hot sausage French bread pizza is an easy and delicious dinner for busy weeknights, movie night or game-day. 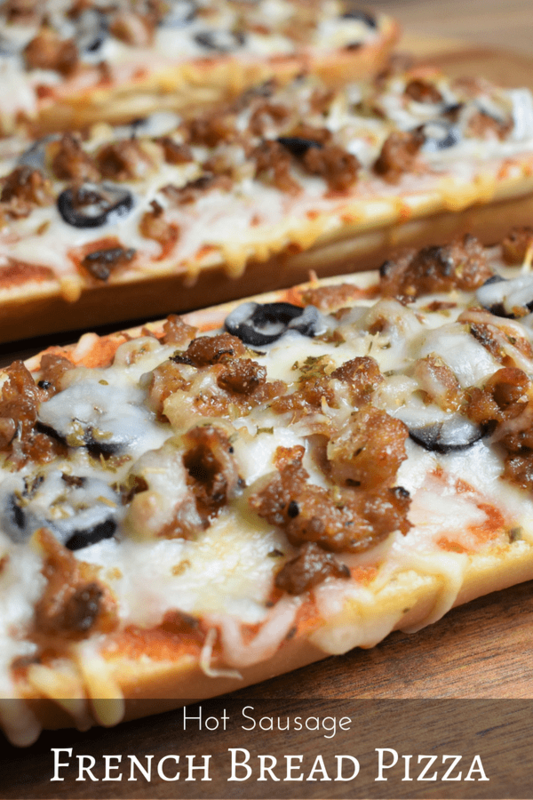 French bread is topped with olive oil, marinara sauce, mozzarella cheese, hot Italian sausage, sliced onions and black olives. The hot Italian sausage cooks up quick, and adds a ton of flavor to the pizza. 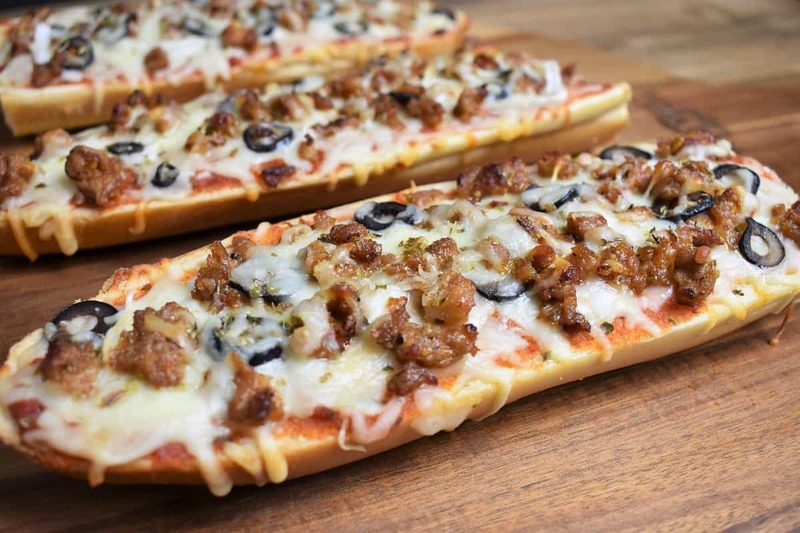 So bypass the frozen pizza section and give a homemade French bread pizza a try. 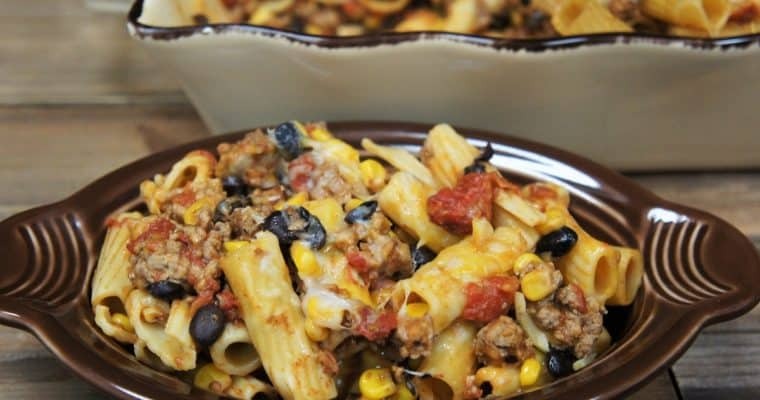 Need more quick and easy dinner ideas? Try this hot sausage rigatoni or this spaghetti aglio e olio with Italian sausage. Enjoy! Remove the sausage from its casings. Using a sharp knife tip, run it along the sausage lengthwise. 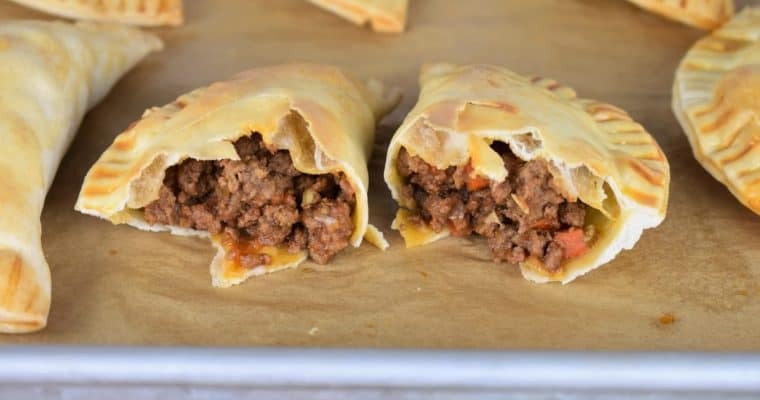 Remove the casing and tear the sausage into small pieces. Heat a non-stick skillet over medium heat. Add the sausage pieces to the skillet and cook 8-10 minutes until cooked through. Stir the sausage frequently while breaking up any large pieces. When the sausage is done, remove it from the skillet and set on a plate that’s lined with a paper towel to drain. Slice the baguette in half, and then open each half by cutting it lengthwise. Brush each piece with the extra virgin olive oil. Spoon on the marinara sauce and spread it evenly on all 4 pieces. Add the mozzarella cheese but reserve some for the top. Arrange the hot sausage, sliced onions and black olives on the pizzas and top with a little extra cheese. Sprinkle the top with the dried oregano and garlic powder. Place the French bread pizza on a baking sheet that’s lined with a cooling rack (if you have one). Bake the hot sausage French bread pizza until the cheese is melted and the bread is toasty. Approximately 20-25 minutes, check it after 15 minutes and gauge the remaining time from there.